Tired of the straight-up margarita? 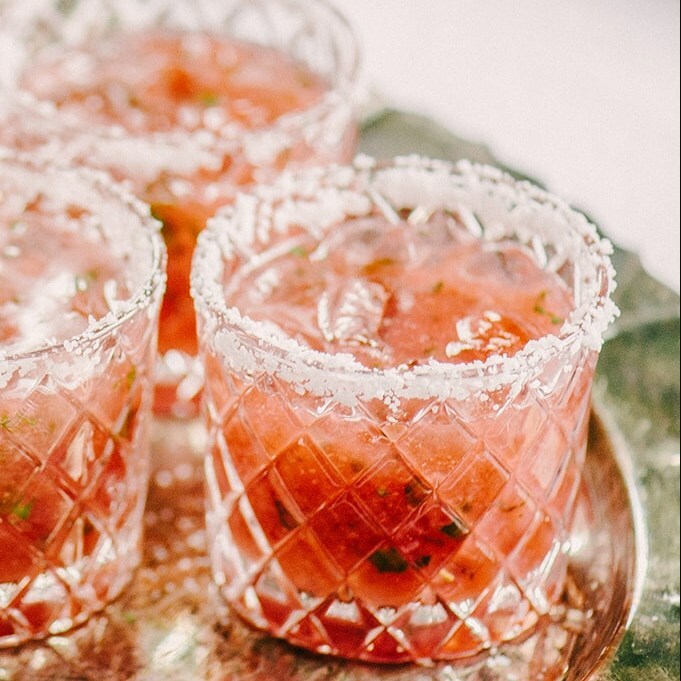 This strawberry basil margarita is a fun curve on the work of art. It's a sweet, tart and reviving mixed drink, ideal for summer outside tasting! These folks are sweet and tart, yet in particular overflowing with the most occasionally proper nectar-from-the-divine beings – no, I'm not discussing strawberries, I'm discussing the all-powerful tequila. Ahhh, tequila. At the point when shot with lime it's darling to all and companion to none. In any case, mixed into this happy bubbly margarita, finished with the ideal measure of salt and poured over smashed ice? Indeed, truly, yes. Pour about 1/4 cup of kosher salt onto a small side plate. Rub the juiced lime rhine around the edge of two rocks glasses, then dip each glass into the plate of salt to rim the edges. Fill each glass with crushed ice or several ice cubs. Place the strawberries, tequila, cointreau, lime juice and honey into a blender. Blend thoroughly on high until the strawberries are pulverized. Finely chop the basil and place into the bottom of a decanter or cocktail shaker. Muddle the basil to release the flavors and oils. Pour the blended margarita ingredients into the decanter along with the muddle basil and stir vigorously to incorporate. Pour into salted, iced glasses and serve immediately. Pour about 1/4 cup of kosher salt onto a small side plate. Rub the juiced lime rhine around the edge of two rocks glasses, then dip each glass into the plate of salt. Place the strawberries, basil, tequila, cointreau, lime juice, honey and a few handfuls of ice (6-8 cubses) into a blender. Blend thoroughly on high until the strawberries, basil, and ice are pulverized. Pour into the salted glasses and serve immediately.